The author has downed plenty of ducks that he says he'd never have found without an amazing retrieve from his now-12-year-old Labrador Maddy (above, bottom). This is a call to action, issued to all wildlife artists out there looking to capture the coveted 2019 federal duck stamp contest: Make 2019 the return of the dog. The eligible species for next year’s stamp, according to the U.S. Fish and Wildlife Service website, includes the black-bellied whistling duck, emperor goose, American black duck, northern shoveler, and bufflehead. It further explains, “you may include related optional elements such as hunting dogs or waterfowl decoys” so featuring a dog is completely in line with the rules. Let’s get a dog into the 2019 stamp and perhaps create a stir among the dog-loving folks who will want to purchase this guaranteed collector’s item. How many times has a dog been on the duck stamp before? Only once. That’s right. One dog in all the years of the Duck Stamp, going back to when the Migratory Bird Hunting Stamp Act (Duck Stamp Act) was passed in 1934. 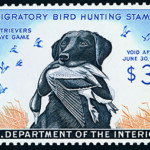 In 1959, the duck stamp featured King Buck, a black Labrador retriever with a mallard in his mouth. 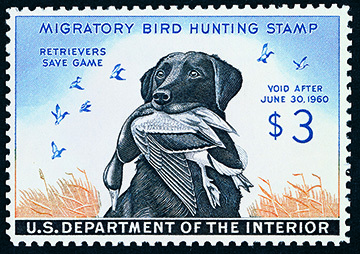 In 1959, the duck stamp featured King Buck, a black Labrador retriever with a mallard in his mouth as a flock of mallards fly from the marsh he monitors. It’s a classic print and one that most every waterfowler has probably seen before. Maynard Reece (who’s now 98 years old) created the 1959-60 black-and-white wash and tempera drawing. Reece also was the first artist to win the competition three times. There are several articles online telling the story of King Buck and the legendary Jay Norwood “Ding” Darling that are worth looking up if waterfowling history is your thing. 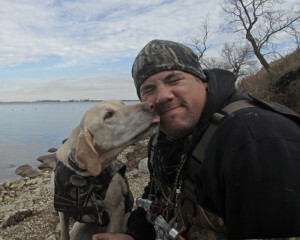 Anybody who waterfowl hunts should understand the value of a good dog. I’d go so far as to wager that without dogs, waterfowling would hardly be a worthwhile venture. From the thrill of watching a bird dog make a solid retrieve to the amazement of having a dog disappear into the marsh only to return with a downed bird, dogs are truly a waterfowler’s best friend. 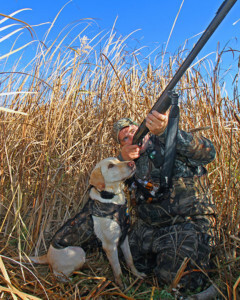 Waterfowling dogs are also great contributors to duck conservation, second only to their waterfowling owners because dogs can’t buy the stamps themselves. And why would any self-respecting dog purchase a stamp if it didn’t feature a dog, right? I’ve downed plenty of ducks that I’d never have found without an amazing retrieve from my now-12-year-old Labrador Maddy. Her waterfowling days have drawn to a close, but she put plenty of ducks in the boat to deserve the cushy life of an old dog. Scot Storm won the 2018 contest with a beautiful wood duck in water print that included a faded wood duck decoy in the background. That means he’s off the hook for this challenge, but Hautman family, I’m looking at you for sure. You, too, Ron Nelson at Outdoor News. Clear some canvas and fire up the brushes. A bird dog with a colorful spoonbill drake or metallic-headed bufflehead in its grip would be a welcomed addition to the gallery of duck stamps. The dog doesn’t even have to be a yellow Lab, but that would be a selfishly wonderful bonus. Let’s give dog lovers a reason to buy a stamp. Maybe it’ll boost sales that have become sluggish over the years as waterfowler numbers continue to drop. If we’re lucky it might even entice a few waterfowlers back into the blind. It certainly couldn’t hurt, and it would be a wonderful nod to those wet-nosed companions that are champions of conservation – the very cause the duck stamp was intended to support.